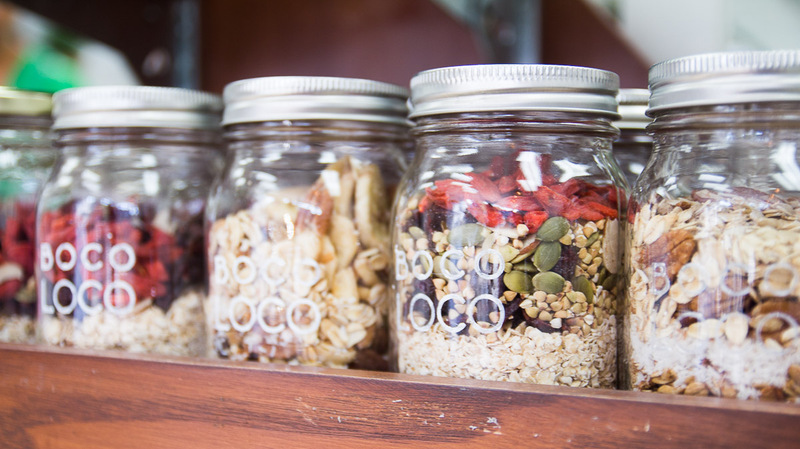 I’m so pleased to have Andréanne Laurin from Epicerie LOCO on the blog to day to tell us about opening up a zero waste grocery store. As with anything, it’s never as straightforward as you would imagine but despite bumps and bruises it’s almost always worth it in the end when you feel that sense of accomplishment. Find out how she did it along with three other amazing women. My name is Andréanne Laurin, and I’m 28 years old. After my bachelor’s degree in Communications and Marketing I decided to do a Master in Environmental Sciences at UQAM. That’s where I met Sophie, Martine and Marie-Soleil, my partners in the creation of Epicerie LOCO. 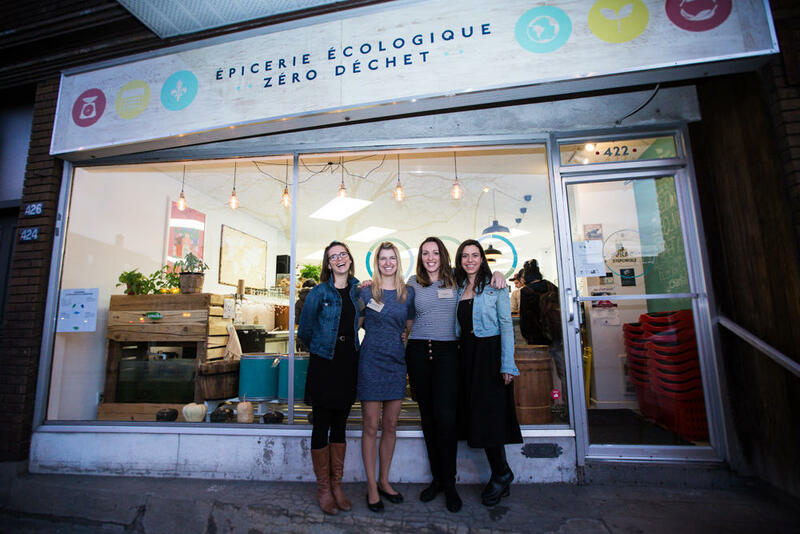 Epicerie LOCO is the first zero waste grocery store in Quebec. My skills in business and finance made me a natural choice for General Manager of our 2 stores in Villeray and Verdun. I’m in charge of the daily operations and business development of the company. It is incredibly exciting and sometimes a bit draining as well! 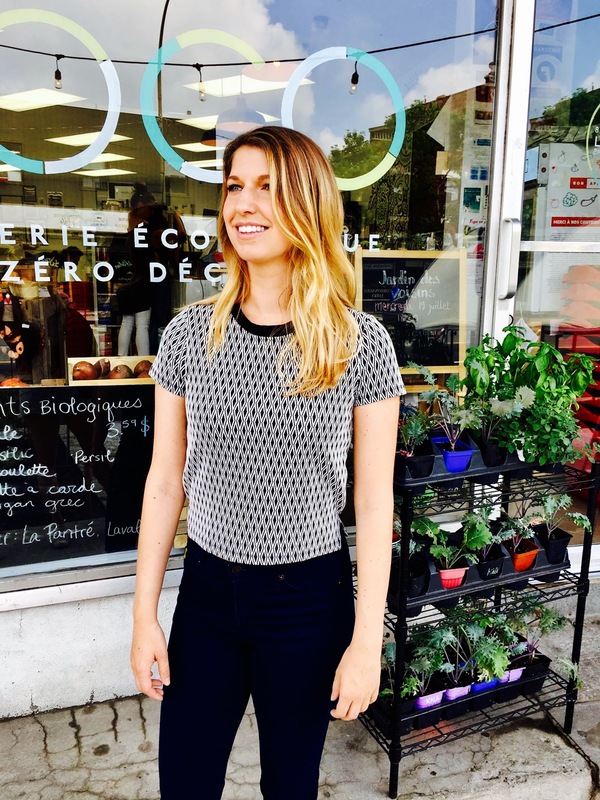 We went this route because zero waste grocery stores didn’t exist in Quebec and we wanted to start our own. We wanted to create a grocery store with a holistic approach that would care for both human beings and the planet. We chose to offer products in bulk to reduce the use of single-use packaging and we also work with suppliers who agree to deliver their products in a zero waste format as much as possible. 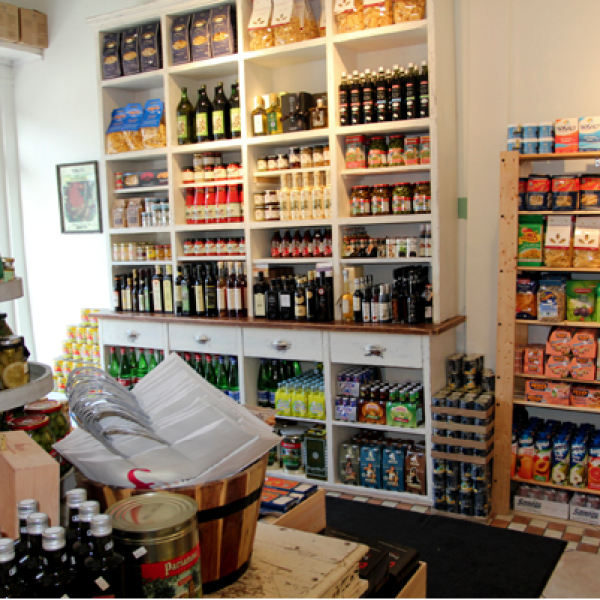 We offer only natural and/or organic products, and we have a strong focus on selling local food from small producers. We love to tell their stories so that our customers get to know where their food comes from. We also work on reducing food waste as much as we can. Our food caterer cooks our fruits and vegetables when they are not fresh enough to be sold anymore. We also pay our employees above the minimum wage. For us, it is just common sense that our company must work this way. That’s why we decided to create LOCO instead of working for someone else! Accept all the help that you can find. Go talk to people who can help you, go see your future competitors and ask them about their reality before you open your own business. It will help you plan as much as possible, even if there are always unexpected events. A lot of people and organizations are available to help entrepreneurs of any kind at every step of the way, so don’t be afraid to seek support! The biggest lesson I’ve learned is that you need to be persistent, no matter what! Owning a business is more than a full time commitment. You need to be available all the time. At the beginning, it’s unavoidable that you must sacrifice some activities in your life. However, the feeling of accomplishment when you reach your goals with your own business makes it all worth it. Before LOCO, I used to go for a run after work or anytime during the weekend. I quickly realized that when starting a business I had to plan my workouts a lot more. So with the girls, we schedule a recurring meeting in our calendars, twice a week at lunchtime, which we call “Go for a run”. It is useful for both our health and our team spirit! When you start a business, you have to do a ton of things that you never did before, in a wide range of sectors such as accounting, finance, procurement, human resources, customer services or even maintenance work. During the creation process, while we were doing all this stuff for the first time, we sometimes realized that the distribution of tasks and responsibilities between the four of us wasn’t optimal, so we had to switch tasks a couple of times for each of us to be doing what we were best at. I don’t really see this reassignment of responsibilities as a failure but it’s something that we didn’t see coming, and that forced us to question ourselves on our strengths and weaknesses. It was definitely a humbling experience! We also realized along the way that the roles in the company needed to evolve very quickly as we were growing fast, so it was a lot of adjustments that we sometimes maybe didn’t do quickly enough. But I think now we are really better at quickly identifying our needs and at using everyone’s skills accordingly. Sleep more and see my friends more often! Can you name your greatest success or something you’re most proud of in your business experiences? We are very proud of the visible difference that we made. 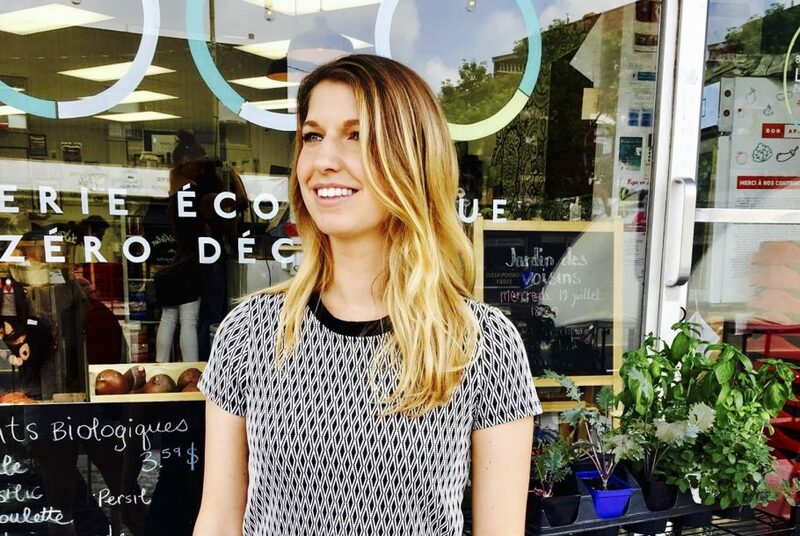 Now, more than 2,500 people from Montreal and beyond choose to buy their grocery in a small zero waste grocery store that encourages local, organic and fair products. And we are always happy to see new zero waste grocery stores opening across the city and the province. It just confirms that we were able to meet the need that many citizens were craving, having an alternative to big industrial food companies, and being able to support small local producers with great practices. What business resources would you recommend to someone starting a creative business of his or her own? The classes to start a business from SAJE Montreal are great! It’s free and it really helps structure your project and challenge your ideas to ensure that your future company is really innovative and meets citizens’ needs. Time – If you’re not all in, it’s probably not going to work. Money – Starting a business usually requires a certain amount of money that you will need to provide from you own pocket or from a financial institution. It is usually risky, and you need to be well prepared to make the right decisions and always have a plan B. Resilience – You will make mistakes and you will face stressful issues: solve them, get up and start again! The four of us studied Environmental Sciences at UQAM. This program made us realise the magnitude of today’s environmental, social and economic crisis. We also realised that the way we consume, especially food and domestic products, is the cause of many issues. So we wanted to stand up and offer a concrete solution for people to consume in a more sustainable way. That’s how we decided to open a zero waste organic grocery store. We spent a lot of time looking at similar projects that were successful all around the world, to get inspired and identify the key success factors. Then, we launched an online survey to better know our future local customers. We wanted to know their needs, their frustrations and their expectations regarding a new kind of grocery store. We needed to be sure that our idea was well-adapted to their specific needs and I think that this approach paid off. 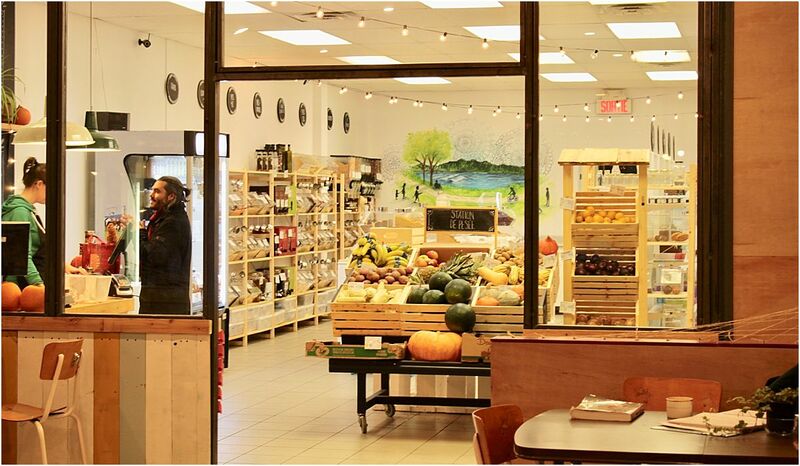 Only a year after opening our first store in Villeray, we were able to open a second store in Verdun. The ton of energy you need to put into it, day after day! But at the end, it is such a rewarding experience! Thank you so much Andréanne! 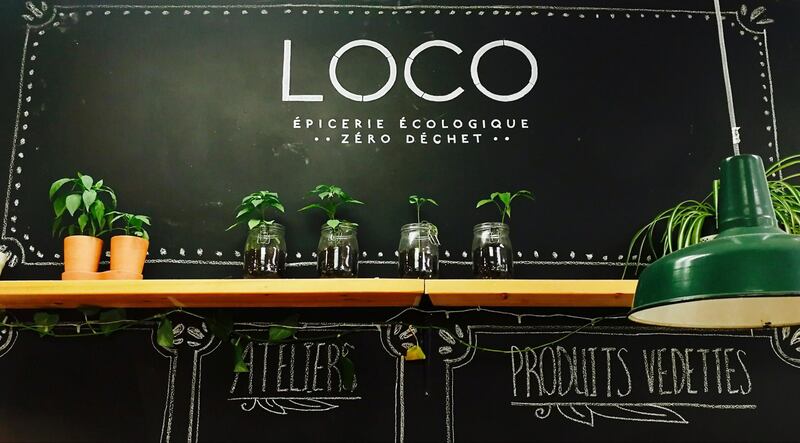 Learn more about Épicerie Loco here.